The three conversations B2B sale pros must have with customers to control every step of long lead buying cycle The most successful salespeople understand that they are fundamentally storytellers. The reality is that to succeed in sales, you need to master the art of customer conversation. The best story told in the best way will always win. Being remarkable and memorable in your conversations is very important—but it goes beyond great delivery. You must be able to articulate value. 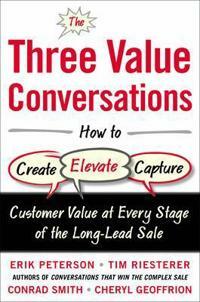 The Three Value Conversations provides the tools and methods you need to differentiate yourself and your solutions from the competition, elevate value to the right decision maker, and maximize all sales opportunities across the entire long lead buying cycle. The book teaches you how to: Create value for your prospects by identifying and advising them on problems, potential threats and missed opportunities Articulate why your prospects need to choose you over rival competitors Elevate the value of your offering to your prospect’s senior-level decision-makers Demonstrate the business and financial acumen required to make a compelling, credible business case for your solution Identify unconsidered needs that only your solution solves Embrace the natural tension that occurs between buyers and sellers to capture and protect the value of your opportunity from unnecessary discounting Not just another sales process book, The Three Value Conversations equips you with practical, hands-on concepts for engaging prospects and customers at any moment in the buying cycle with the specific stories and skills to create, elevate, and capture value.